Thought you all might enjoy some photos of some outboard racing equipment your striving webmaster and tech support guru created and competed with in local and national events. 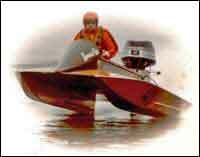 These shots are from my OPC (Outboard Performance Craft) racing days. Given time, I will also add more of these and some really ancient pics of stock and modified stuff from the 50's and 60s! My friend Burt Fraley purchased a boat from me for SJ and decided to set it up as a "kneeler". We were probably the only team to run tunnels like this, a holdover from our "stock" division days. One morning out testing, the lake was glass, the fog lifting, and here comes Burt and the UJ out of the fog right up atcha' and running. The rest of these pics are live links to a larger shot, you can just close that window when you're through. 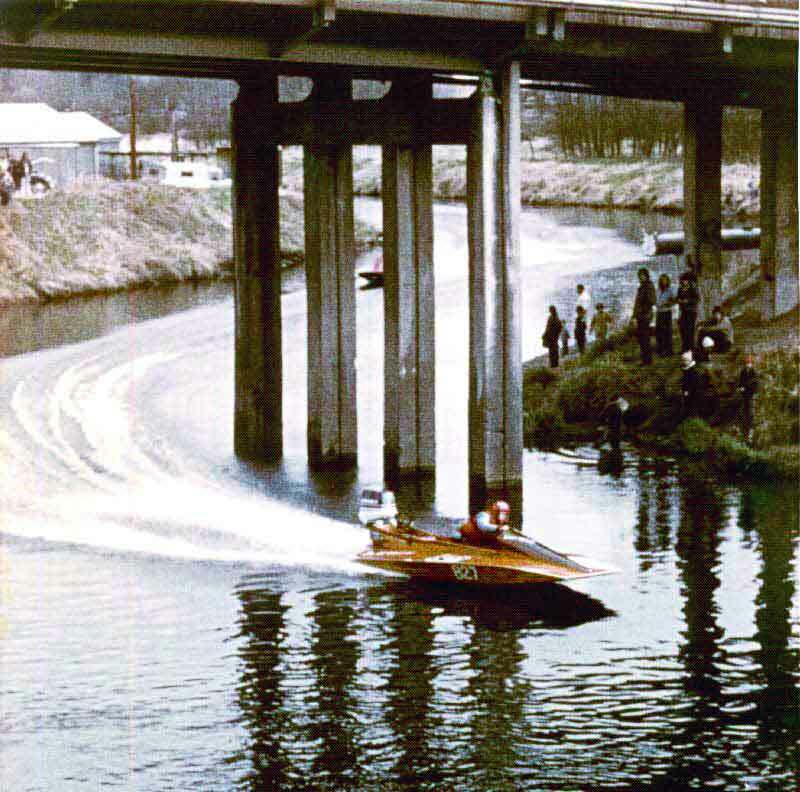 Here's my first tunnel with a 1967 Evinrude X-115. Bought this old thing as a wreck from folks who had used it for a plug to build glass copies. I removed all the innards, even the frames and transom, rebuilt it and proceeded to prune the glass copies! This was my favorite boat of all. I could fill pages with race tales. 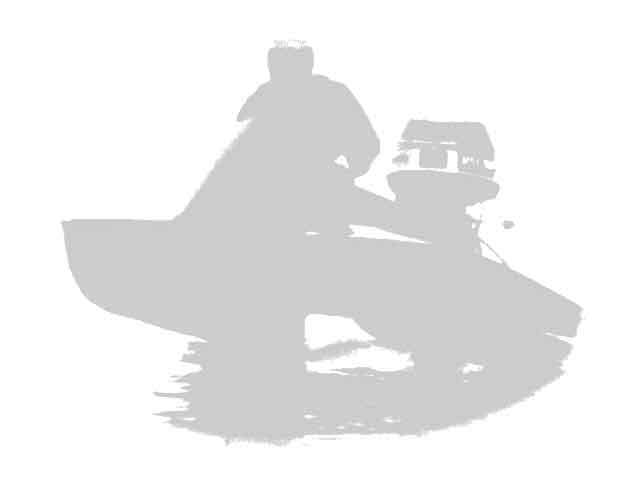 The motor is a 1970 Evinrude model KC13R, soon superseded by the KR15M "super-strangler" and Johnson equivalent "stinger 2". I was able to hang right with most of those guys and I was 25 HP short! 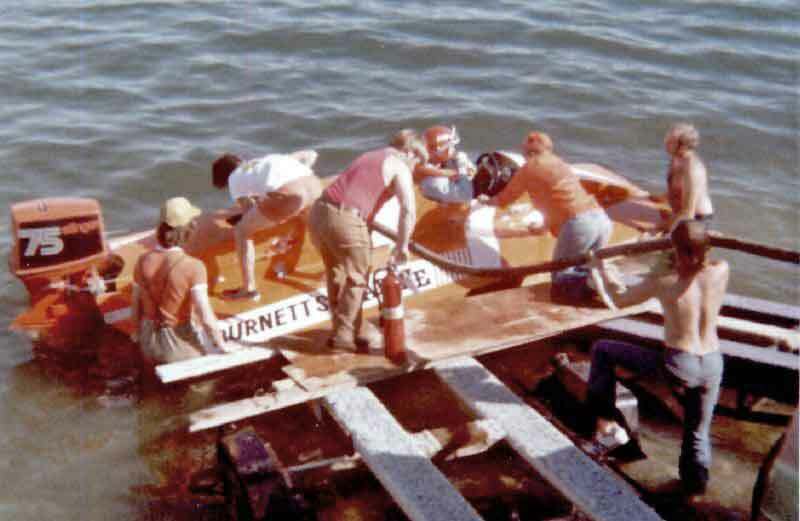 1975 Sport E Marathon Nationals in Eufaula, Alabama. Motor started for the milling period, lined up for dead engine off the beach marathon start, hit the switch, nothing. The starter thru-bolts had failed in tension and the brush base fell off. I was disgruntled and was walking the boat back to the pits when the Factory team guys came and helped by lifting the boat, starting it with the rip cord and slamming the cover on before I left. I was 2 and a half big laps behind, but made up all but the last 100 yards. Another lap and I would've won. This was the ONLY time I ever had a mechanical breakdown in all my OPC days. Mighta' known it would be the nationals! 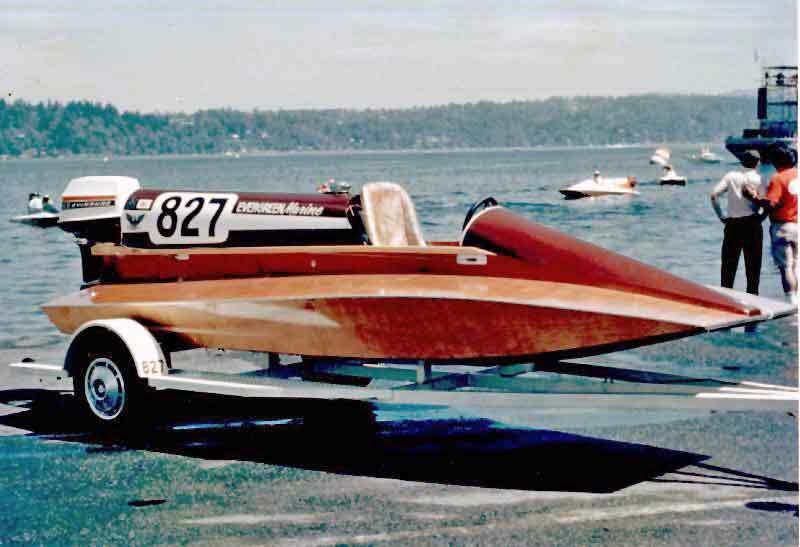 The Sammammish Slough race is one of the oldest races in the Northwest. Wild and wooly, you were apt to see as many boats out on the bank as in the river. The toughest corner was at the Bothell bridge, sharp decreasing radius S after a straight-away, Lots of guys didn't make it. The kid was #1 this weekend! 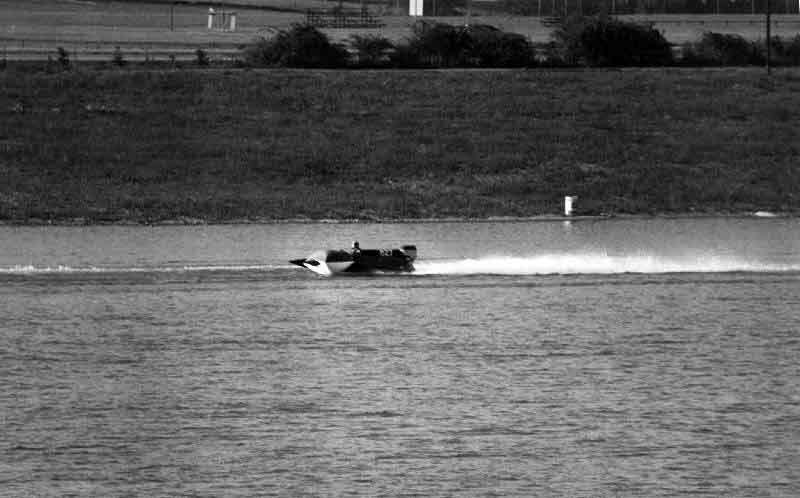 1976 Sport E closed course Nationals, Dayton Ohio. So while I didn't break down this time, it was worse! Won the first heat hands down. Got a poor start for the second (or so I thought, several had jumped the gun). All I had to do was stay where I was and it was MINE! But, no, we were not sophisticated enough to have a radio, so I was clueless. My math said I had to pass 2 boats. Got one, but the second closed the door and I hooked left just a little on a wake and presto - Hung the buoy right on the pickle! How embarrassing. Worse, when I slowed it deflated, but blew right back up again when I speeded back up. What a screamer!! Jim Jost, Evinrudes PR manager at the time got this shot. After submarining my boat at the 1976 iteration of the Lake Havasu Arizona Outboard World Championships, for the 77 race I teamed up with my friend Darrel Beaulier from Houston TX. Here's a refueling stop, I am driving, Darrel is beside the cockpit. Oh, yeah - we won the class! 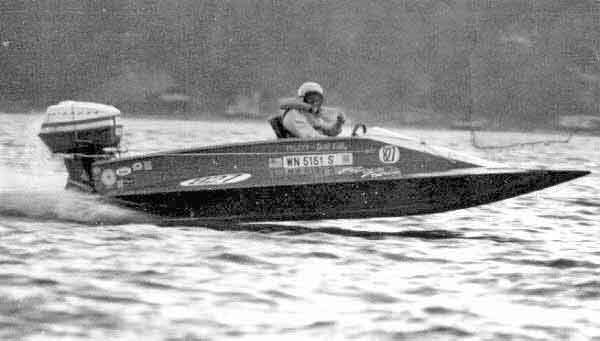 Here's the last kneeler configuration at the 1979 Northwest divisional championships. Kicked A$$! This little SE boat was real fast and fun to drive. No more open cockpit flying these days, sorry - all the OPC classes are capsule boats. I know how those old WW 1 flying aces felt when they were asked to get in a closed canopy fighter cockpit. NO Waaaay! 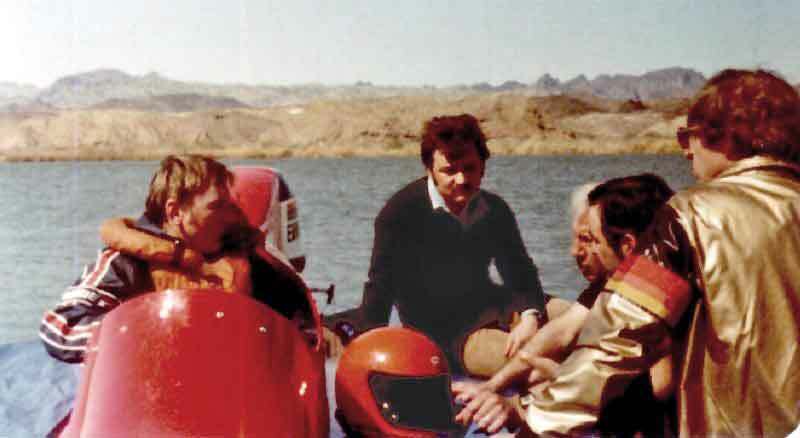 As a last shot, here's the group that provided OMC with racing expertise. Too bad the company treated racing as only some motor testing. These guys worked hard. In the boat, Bobby Hering. On deck, Molinari. Rest of the crew; Jack Leek OMC's race director, Fred Hauenstein, Ron Anderson. I hope you enjoyed this little tour of triumph and tragedy, we traveled all over the USA and Canada and saw the countryside as well as meeting a lot of great folks along the way. Looking forward to some more happy times with outboards in the near future. GOT A QUESTION THAT'S NOT ANSWERED HERE?